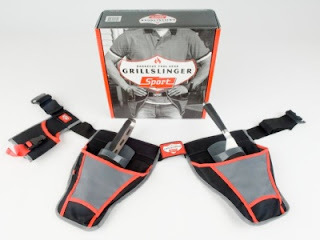 This 'Grill Slinger' gift includes handy pockets on the left and right for your BBQ utensils and a special insulated holster around the back for a beer. If you know someone who loves to be the man behind the barbie then this gift could be for them. The fastest spatula in the west could gain extra points with your guests. The gift comes with a belt, several BBQ tools and special knife sheaths. Purchase the BBQ Utility Belt from the Packed Full of Love Online Gift Shop. Perfect for the bloke who you'll always find behind the BBQ cooking up a storm. Packed Full of Love has a unique Aussie Online Gift Shop which stocks all sorts of gifts for different people, occasions and tastes. There's something for everyone, come in and have a browse, you won't be disappointed.